Sihan of Befuddlement chose the Blueberry Crumb Cake in Baking From My Home To Yours for this week's Tuesdays with Dorie. The fabulous Dorie Greenspan, who our group is named for, has been nominated for a James Beard award in Journalism. Hooray for Dorie and congratulations! On a slightly related note, did you know that, besides following me @PheMom you can now follow the group on Twitter as well as Dorie herself? Check it out @DorieGreenspan and @TuesdayswDorie - just thought if you are a fellow tweep you ought to know. Speaking of, if you are a fellow tweep - please let me know so that I can start finding you (if I don't already). Please leave me your Twitter username in your comment so I can follow you too! Back to the Blueberry Crumb Cake. This cake was really fun and easy to put together and came out with beautiful results. The flavor of all of it together is amazing. If you love blueberry muffins, then think of this cake as a huge step up. I made the cake exactly as directed, but, since I was out of walnuts, used pecans in the topping. It was amazing and I'm sure even better with the walnuts! 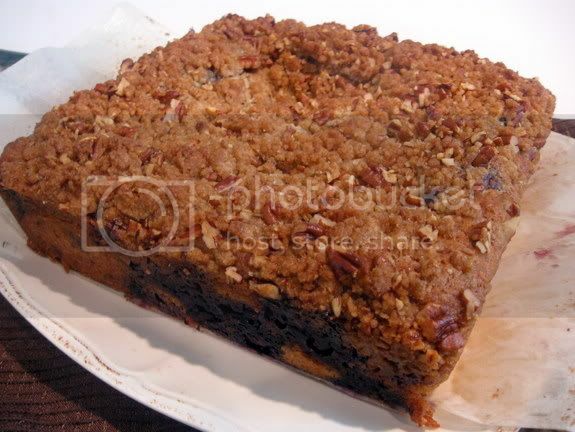 Even though I loved this, I have to admit, I am still partial to the Jam Crumb Cakes I made a while back. 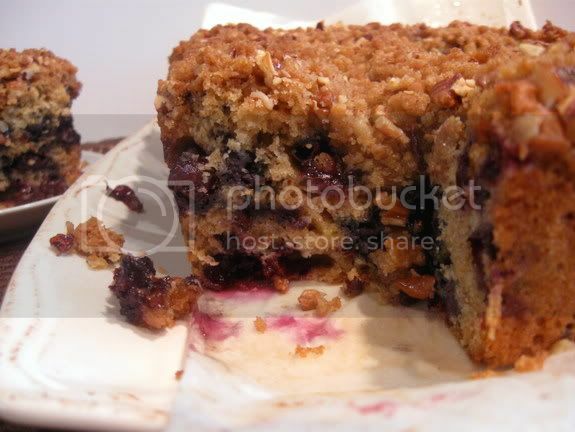 I still don't entirely love baked fruit, so the blueberries in this were sometimes not my favorite part. That said, I can't wait to try this recipe with some peaches next since they are the one fruit I do like when baked. I you haven't already entered the Macy's Giftcard Giveaway I'm doing, then you have until midnight Thursday to comment and enter to win. It is a really easy one to enter, so follow that link and get to it! 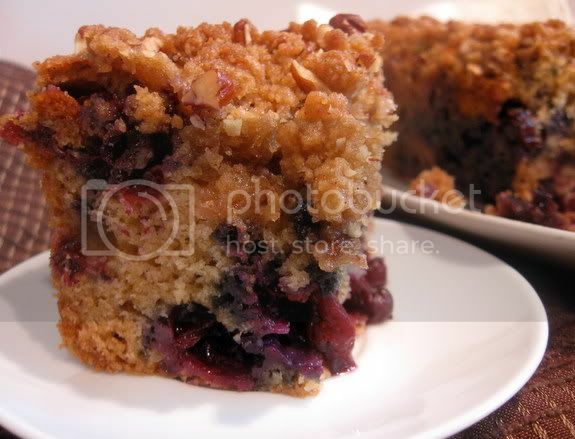 I love this cake, I make it with mixed berries and almonds. So good! Great photos you have here! This looks just delicious. Nice work! Boy, does this look delicious! And those jam crumb cakes make me want to run home and make one NOW. Mmmm, peaches! I think I might try that next time, too. Anything with that topping would be fabulous, I'll bet. Your cake is so pretty! Great job! Thanks for posting the news about Dorie too, I hadn't seen that. My twitter is twilhelmsen. Ah, if only I twittered... Just one more thing I can't really get into :) Your cake looks fantastic! What a perfect looking crumb! The cake sounds delicious! Your cake looks so wonderful! The texture is just perfect! Beautiful photos. I loved this cake - peaches are a great idea. delicious! love the little blueberry explosions inside! This looks awesome, You have inspired me. I gotta go get that book! Holly, that looks amazing. The little blueberry juice on the plate. Fabulous.